What is the PhysioRoom.com Elite Hinged Knee Brace & Reusable Hot / Cold Gel Pack (regular)? This bundle has been designed for the treatment of knee ligament injuries and cartilage tears. Fitting perfectly, the Elite Hinged Knee Brace provides excellent support during recovery and the reusable gel pack is versatile and mouldable and can be used as a therapeutic recovery aid, as a hot or cold pack, for all injuries. For use with all knee ligament, cartilage injuries or arthritis. Perfect for weakened or painful knees, it is ideal for use as a rehabilitation brace following knee injury. The breathable Airmesh fabric means it is ideal for light sports and skiing. This fantastic great value product can be used time and time again and is suitable for use throughout all stages of recovery. 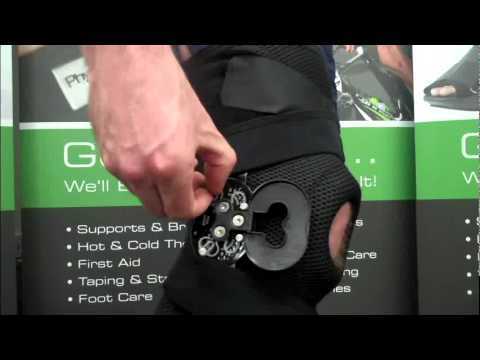 The Elite Hinged Knee Brace can be fitted to the left or right knee. Allowing for a 0-90 degree flexion and extension to stabilise the joint and prevent hyper-extension,The PhysioRoom.com Elite Hinged Knee Brace features an adjustable ROM hinge, which reduces the chance of an injury re-occurring. Because its Airmesh breathable construction allows air to circulate freely, the Elite Knee Brace can be worn for extended periods of time. The multi-filament, four-way stretch fabric provides a stable and supportive fit and comfortable cushioning. The soft gel in the pack conducts heat or cold. Simply cool in a refrigerator or freezer and it will stay cold, or warm in hot water (or microwave oven) in order to use it as a hot pack. Always follow the manufacturer's instructions. Provides support and pain relief for mild to moderate medial / lateral and anterior ligament damage and gel pack can reduce swelling when cold or relax tight muscles when heated. PhysioRoom Elite Hinged Knee Brace - Adjustable Ligament Support & Gel Pack - Ligament Injuries - ACL is in stock and available for immediate dispatch from our Warehouse facility in Lancashire, UK. Orders placed by 4pm Monday to Friday (excluding Bank Holidays) are dispatched the same day. If you need your PhysioRoom Elite Hinged Knee Brace - Adjustable Ligament Support & Gel Pack - Ligament Injuries - ACL in a hurry, next working day delivery is available for UK mainland addresses.